Om Sri Sairam. It was a moment of joy and pride for all of us in SSSSO and for the Education Wing in particular, when Harshitha Sampat, a Balvikas alumna from Tamil Nadu (West Mambalam Samithi, Chennai Metro West District), was conferred with the prestigious Sri Shanmukhananda Bharat Ratna Dr.M.S. 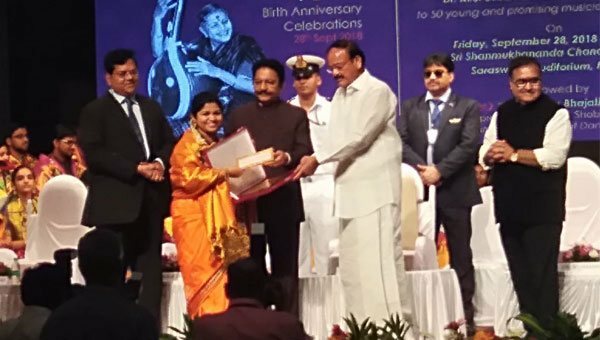 Subbulakshmi Fellowship in Music by the Hon’ble Vice-President Of India Shri.Venkaiah Naidu and the Governor of Maharashtra Sri.C.Vidyasagar Rao, on September 28th 2018 at Mumbai. Under this fellowship instituted by Sri Shanmukhananda Fine Arts and Sangeetha Sabha, Mumbai, in honour of Bharat Ratna Dr.M.S.Subbulakshmi, Harshitha would be receiving a grant of Rs.1 lakh per year for 3 consecutive years. 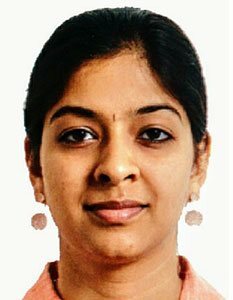 As is with such elite awards, the path to the top was quite challenging says Harshitha. Each year, 20 to 25 young promising musicians from various parts of the country are selected by an expert committee consisting of legendary musicians who meticulously review their musical journey and conduct auditions to assess these young talents. As part of the selection criteria, a thorough evaluation and assessment is conducted to ascertain the degree of musical prowess of the candidates during their concerts; and the number of concerts performed in the preceding three years are also taken into consideration in the appraisal process. She goes on to add that it was truly Bhagawan’s grace that her unrelenting efforts were recognized and rewarded and that she is and always will be a Balvikas alumnus first and a musician second. A promising young Carnatic vocalist and Dr.MGR Medical University Rank Holder in Audiology and Speech Language Pathology, Harshitha is a child prodigy, being able to not only identify about 40 ragas at the age of one and half years but also being able to notate the phrases by the time she turned 3 years. 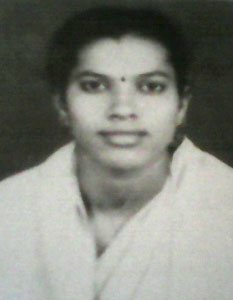 She has been learning music since that tender age, from Vidwan Sri P.B.Shrirangachari and her father Vidwan Sri S.Sampat, both disciples of Padma Bhushan, Sangeetha Kalanidhi Madurai Sri.T.N.Seshagopalan. As a toddler, she grew up listening to the music of various great maestros and has been constantly updating her knowledge in the field of Music. Her performances with her mellifluous and mesmerising voice have been appreciated for strict adherence to tradition coupled with her own charming brand of creativity. She emerged STATE FIRST in the BHAJAN COMPETITION conducted by SRI SATHYA SAI ORGANISATION, Tamil Nadu in 2008. Swami has been blessing her with many opportunities such as the ‘ONE WITH SAI’ concerts AT BRINDAVAN ASHRAM, WHITEFIELD, BENGALURU and at SAI PREM HALL , VASHI , NAVI MUMBAI. She has also performed at SUNDARAM – SRI SATHYA SAI TEMPLE, Chennai on the eve of Ugadi. 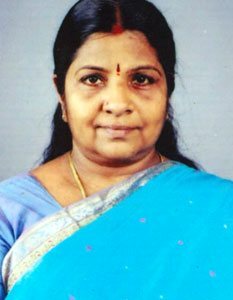 She was a lead singer in the musical presentation ‘GAANAMRUTHAM’ by Balvikas students of Tamil Nadu at Prashanthi Nilayam in the Divine presence in 2015. 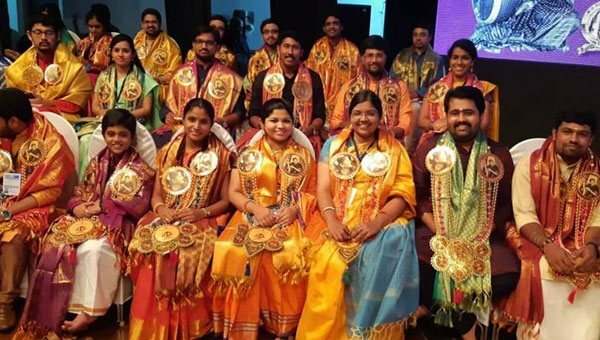 Harshitha was awarded the Scholarship by the Dept of Culture, Government of India for Carnatic music since 2008 and was selected for attending the cultural festival of arts by Government of India, due to her meritorious performance. 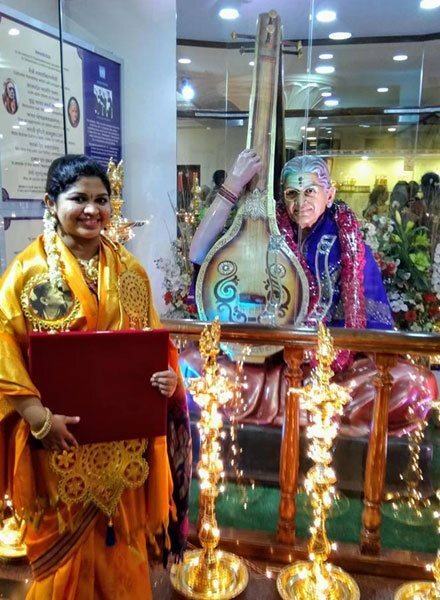 She has received many prizes from the leading Sabhas, such as 1st Prize in Ragam Tanam Pallavi Competition conducted by prestigious Madras Music Academy and Narada Gana Sabha and also emerged as the Winner of Carnatic Voice Of Chennai Competition in Senior Category conducted by Rotary Club, Chennai. 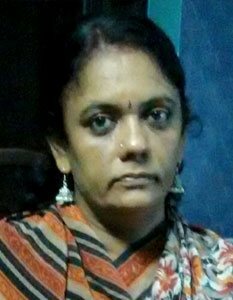 She was awarded the title ‘ISAI CHEMMAL’ in the Trinity Arts Festival of India in 2016.She has been performing in many prestigious Sabhas all over the country like Thiruvayyaru Thyagaraja Aradhana Music Festival , Shanmukhananda Fine Arts and Sangeetha Sabha (Mumbai),Bharatiya Vidhya Bhavan , Brahma Gana Sabha, Sri Krishna Gana Sabha, , Odukkathur Mutt (Sri Ramakrishna Bhajana Sabha Trust, Bengaluru), The Fine Arts Society Chembur(Mumbai), Karthik Fine Arts, Rasika Ranjani Sabha ,Naada Inbam (Ragasudha Hall) ,Chennai Cultural Academy ,Sri Rama Bhaktha Samajam,etc. 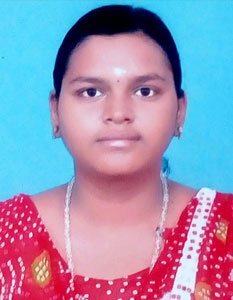 We hope and pray to Bhagawan to bless her with more such accolades and laurels. Jai Sairam. Please find below instructions received from the Deputy National Coordinator. Please spread the message regarding the Alumni Meet and convocation -2019. The audio of the songs to be sung by the Alumni during the Meet are given below. The songs are accompanied by the lyrics. This victory song that pays tribute to Sai comes with a beautiful and relevant message. It emphasizes that, the dearest children of Mother Sai - the Balvikas children, are truly the torch bearers for shaping a peaceful and loving world of tomorrow. By infusing love in every heart and seeing God in every being on this earth, the Balvikas children will strive to make this world a better place! The Gurus are requested to circulate the lyrics of these songs to the Alumni who are going to attend the meet and train them to sing it well. All Alumni and Group III students should report at Prashanthi Nilayam by 4th January, 2019. Food will be provided on Friday (Dinner), Saturday (Breakfast, Lunch and Dinner), and Sunday (Breakfast and Lunch). Cost for accommodation in rooms for Alumni will be borne by them on sharing basis - 4/5 in room. Balvikas Convocation Students and present Group III Children to be accommodated in sheds. Costs for the same to be borne by National Fund. The last date for sending the Alumni and convocation name list is 1st December, 2018. Please send the names to the State Educational Coordinator. Please send articles on the topic "Golden moments in Sri Sathya Sai Balvikas". The article should have a maximum length of 300 words with the name and state written at the end and passport size photograph of the student affixed on the top of the essay on left side. The article can be from either the Alumni or Group III student and should reach by an email attachment to the State Educational Coordinator by 5th December 2018. Learn the group songs to be sung by all participants. Please send an article by one alumna/ alumnus for Coffee Table Book/ compendium, please ensure that we ask the CHILDREN/ GURUS/ PARENTS/ ALUMNI to emphasize on the effect of transformation/ impact of balvikas in the lives of Balvikas students or their respective lives on the topic "Golden moments in Sri Sathya Sai Balvikas". Not more than 250 words with passport size photo of writer of article. The article should reach me before 3rd December. Please send the name of one alumni boy and one alumni girl best bhajan singer from your district. The last date for sending this to the State Educational Coordinator is 5th December 2018. Gurus accompanying the students should ensure discipline in Prashanti Nilayam. Parents accompanying students have to make their own arrangements for accommodation. Convocation will be held on 6th January, 2019 morning. All girls receiving diplomas should come in white salwar kameez with dupatta /white sarees with scarves to be provided. All boys receiving diplomas should come in white shirt and pant with scarves to be provided. Boys on both days to wear white shirt & pants or kurtha & pyjama. 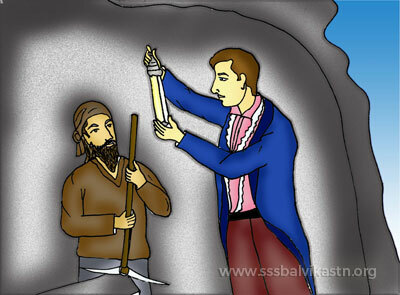 This year we are celebrating Golden jubilee of Balvikas and hence we should not miss the golden opportunity. 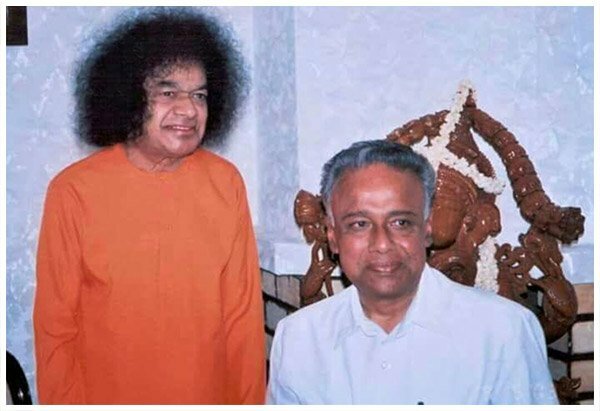 The Sai fraternity woke up Tuesday morning with the sad news of Sri.Srinivasan merging with Swami on 25th July 2017 around 12:15 am. He first met Swami in Chennai in the year 1970 and ever since never looked back. A qualified engineer, Sri. Srinivasan is a well known industrialist and was the chairman of W.S. Industries. He served in Sri Sathya Sai Organisations in various capacities and chose to hand over the reigns of All India President of Sri Sathya Sai Organisation to Sri. Nimish Pandya. a year ago , Sri. Srinivasan who was also the Trustee of Sri Sathya Sai Central Trust, Sri Sathya Sai Institute of Higher learning and Sri Sathya Sai Medical Trust gave up his positions on health grounds. On May 8th 2017 he lost his wife Smt. Vidya Srinivasan and in spite of his age related ailments, Sri Srinivasan was still active in participating Sai Functions and he addressed the state level programme that was held on Saturday in ECR road Chennai and also in Sundaram ashram in Chennai on Sunday with the portable oxygen parameters which he had to carry after he developed some age related complications. This shows the love he had for Swami and for Sai Organisation. Like a warrior who prefers to die in the battlefield, Sri. Srinivasan merged in Swami while still being active in sharing his words of wisdom with fellow Sai brothers and sisters . May Swami give all the strength to his family in particular, who lost the parents in such a short span. Thank you Srinivasanji for playing your role in the Sai mission and for guiding thousands of devotees at various capacities. A Great Opportunity for Gurus !!!!!! Here comes an opportunity for Sri Sathya Sai Balvikas gurus to rack their brains and assess their thoroughness in Bhagawan's messages. Avid quizzers from any part of the world can take part in the online quiz that will be thrown open on the holy day of Guru Poornima (July 9). 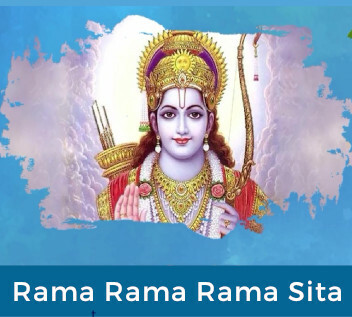 A set of 30 multiple choice questions based on Bhagawan's messages in "Summer Roses on Blue Mountains 1976" will be posted on for a week (July 9 to 15) and the results will be published on July 22. Those interested can start preparing by reading Summer Roses on Blue Mountains 1976. Download Summer Roses on Blue Mountains 1976. The Sri Sathya Sai Balvikas Program has been founded by Bhagawan Sri Sathya Sai Baba to enable a world-wide renewal of individual commitment to an active moral life. Bhagawan Baba says: "You must study to become steady. See to it that the Divine Love in your heart is steady. 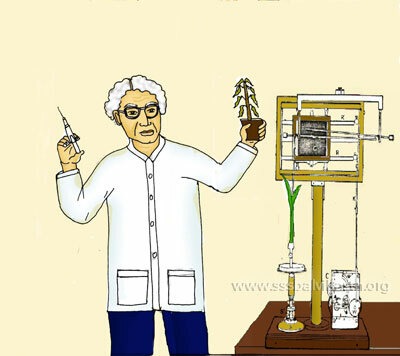 The goal of education should not be to just acquire theoretical knowledge but to practically apply it in your life. Birds and animals lead life without ‘studying’, but your education must result in you developing a strong and good character." 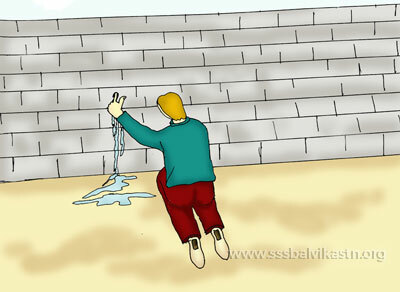 Balvikas means blossoming of Human Excellence. Human values can neither be imbibed through textbooks nor can they be gifted by anyone. They are inherent within each individual and the Sri Sathya Sai Balvikas program provides the right environment for these latent human values to blossom and empowers each child to unfold the innate values within oneself to the highest perfection. Since the focus is on bringing an intrinsic transformation within each child. The Bal Vikas classes are conducted as a part of the Global Mission of the Sri Sathya Sai Organisations to direct the children of today – the torch bearers of tomorrow’s society, into the path of self-enquiry and self-discovery. With this conviction the Sri Sathya Sai Bal Vikas Program has been designed to help children to practice the basic human values, namely, Sathya, Dharma, Shanthi, Prema and Ahimsa. Through the judicious use of simple teaching techniques such as: Prayer, Group Singing, Meditation, Story Telling and Group Activities, the Balvikas Gurus encourage the children to become conscious about the latent potential within and orient their lives on the trajectory of human excellence. This in short is the sum and substance of Sri Sathya Sai Balvikas Program. The end of wisdom is freedom; The end of culture is perfection; The end of knowledge is love; The end of education is character. You cannot see Me, but I am the Light you see by. You cannot hear Me, but I am the Sound you hear by. You cannot know Me, but I am the Truth by which you live. Start the Day with Love; Spend the Day with Love; Fill the Day with Love; End the Day with Love; This is the way to God. If wealth is lost, nothing is lost. If health is lost, something is lost. If character is lost, all is lost.